Two of the Wizards from this site were right down the front of the pit and they will be posting their podcast review of the show on here very shortly, no doubt featuring tales of queueing derring do and being touched by the hand of Bruce. In the meantime, here is my review from further back on the pitch. I had to work yesterday so I couldn’t join in the fun in the pit queue with the other Wizards. But fortunately The Boss (at my work) is a big fan of The Boss so she let me finish work early to make my way down to Coventry. All was going well and by 3 o’clock I was at Stafford services and feeling confident that I would easily get there and parked up in time for the stadium doors opening at 4:30. It was slow progress all the way and very frustrating. I began to doubt I would even make the 7pm start. Naturally I had Bruce on the car stereo, but even that wasn’t providing me with much comfort. When I was stuck in stationary traffic somewhere near Tamworth and he sang “Someday we’ll look back on this and it will all seem funny” that really didn’t help. Things actually got so bad that at one point I actually TURNED OFF THE MUSIC! Unbelievable but true. To cut a rather dull travelling anecdote short, when I got near the ground the traffic wasn’t moving there either so I just dumped the car in a layby and ran about 3 miles to the stadium. I was sweating more than Bruce himself! Got on the pitch, paid £4.50 for 1 pint and then the show started. 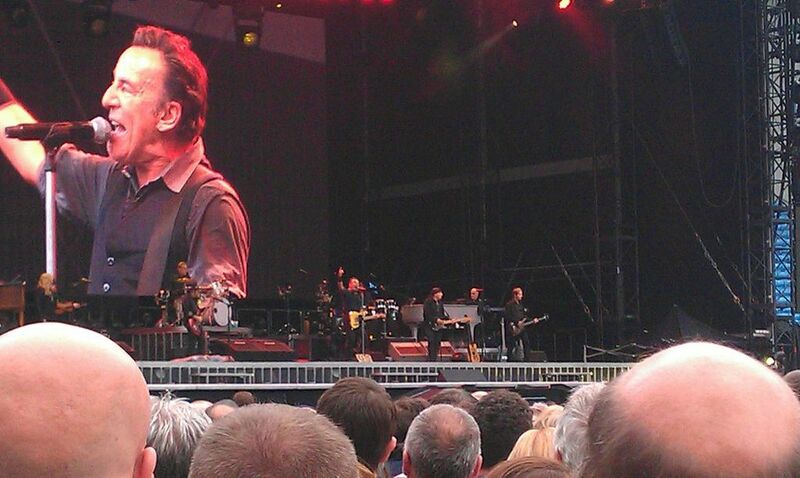 Good timing Bruce, thanks for waiting for me! Nobody wins unless everybody wins! At this point, I could just go through the setlist talking about every fantastic moment (see full setlist with videos & pictures on the marvellous and informative Brucetapes.com) but instead I’ll limit myself to just a few highlights. Great song. Mighty Max Weinberg’s drumming was incredible on this. But I was particularly thrilled on behalf of my 2 fellow Wizards because I know that this is a big favourite with both of them and I was happy thinking of how much they would be enjoying that one down the front. Wow! Played for someone in the crowd with a sign requesting it for their newborn kid Ruben. One of my absolute favourites and a song that really means a lot to me personally. It really resonates, I was welling up in this one. ALL OF BORN TO RUN!! YES THEY PLAYED ALL OF BORN TO RUN!! All of the album was amazing of course but especially Backstreets and of course, Jungleland. Jake Clemons played it just note perfect and I was welling up again. But I’ve always thought that the real unsung hero of the Born to Run album is piano player extraordinaire Roy Bittan and for me he stole this part of the show. That man is a marvel. He did play pretty much the same songs off Wrecking Ball that he played last time I saw him (Manchester, 22nd June 2012). But why complain when those songs are as great live as We Are Alive, Wrecking Ball and especially Shackled and Drawn and Death to My Hometown. That means 3 songs in a row. Big hitters Born in the USA and Dancing in the Dark with my favourite song on the album Bobby Jean in the middle. More stellar work from Jake Clemons on that one. The Big Man must be very proud. Party anthem! Always loved the version of this on the Live 75-85 box set. It just sounds like the band and crowd are all having a great time. Seeing it live was even better. Great song. I wonder how many times Bruce says this in a typical gig. When it comes to count-ins, he makes The Ramones look like part-timers. Lots more I could say but I wanted to keep this fairly short because I haven’t yet heard what the other Wizards have said in their review and I don’t want to just say the same stuff. What a night though! The Ricoh Arena has not seen that much excitement since the days of Dele Adebola! The drive home was much more straightforward than the journey down. I was listening to the wonderful Janice Long on Radio 2 and I sent her a text which she read out giving a plug to this very website. That was a particular thrill for me. I love Janice Long because her radio shows made a HUGE impression on my musical tastes as a teenager. Thanks Janice! 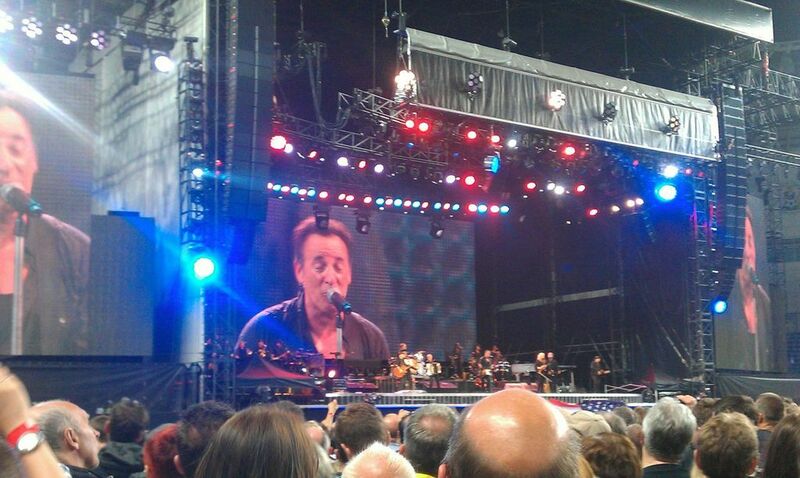 Posted by chorizogarbanzo on June 21, 2013 in Blog posts and tagged Born in the U.S.A., born to run, bruce, bruce springsteen, coventry, e street band, Jake Clemons, James Gandolfini, Janice Long, Ricoh Arena, roy bittan, the boss.